SPECIAL REPORT: How do you attract and retain talent in northeast Indiana? In the last 10 years, it’s gotten easier to attract and retain top talent in northeast Indiana. Just ask the region’s largest employer, Parkview Health. With offices, clinics, and hospitals across the region, Parkview is responsible for staffing multiple locations—everything from entry-level jobs to highly specialized positions—and in some ways, their work is getting easier. Jeff Rice, Manager of Talent Acquisition, says the revitalization happening in Fort Wayne and other regional cities is making it easier to attract candidates from big cities. “This is just a small sample size, but if you look at some of the recent leadership we’ve brought in from Chicago and Detroit, people are coming to Fort Wayne because there are things for them to do here,” Rice says. With projects like riverfront development, The Landing, and Electric Works underway, not to mention a host of new restaurants and breweries, there’s a sense of excitement building in northeast Indiana. But while Fort Wayne and its surrounding cities are riding a wave of investment right now, national unemployment levels remain low and baby boomers continue to age out of the workforce, meaning there are more jobs available than there are people to fill them, Rice says. “What makes it difficult is, in today’s market, potential employees have their pick of jobs in their current city, so cities may struggle to attract new talent,” he explains. In other words: It’s a candidate market. Top talent can go anywhere. So how does Fort Wayne compete to attract and retain talent here? 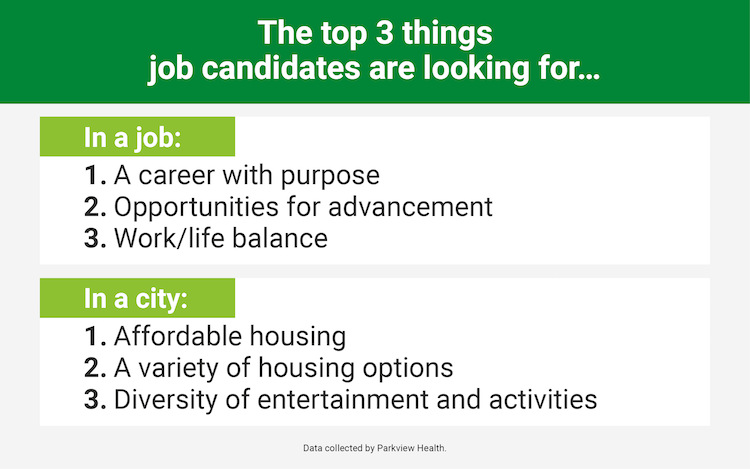 Parkview’s team has three tips that employers in many industries might be able to apply. 1. Streamline your hiring process. One of the first ways Parkview is innovating to attract top talent is by updating its hiring processes. Hallie Custer, Director of HR Operations at Parkview, says the strategies that once worked for attracting candidates are no longer relevant in the current market or the digital age. As the lead on talent attraction, Rice says that one of the key ways Parkview is updating its processes is by changing the way it communicates with candidates to meet them where they are. “We’re always looking at: What is the best way to reach an audience?” Rice says. Training gives recruits hands-on experience to feel comfortable in their new positions. Instead of the traditional phone calls or emails to set up job interviews, Parkview is now implementing texting software to help candidates schedule interviews faster. It’s shortening its online application process, too. “The hour-and-a-half-application is not going to work anymore,” Custer says. By streamlining these processes, Parkview is making sure job seekers know they are important to the organization from the start. 2. Provide thorough, hands-on training experiences. While recruiting processes might be speeding up to meet the digital era’s need for speed, Deb Stam, Director of Leadership and Development at Parkview, says candidates’ needs shift once they land the job. That’s when they want to start taking things slower, she explains. So by the time they get to her part of the process in orientation, their training slows down for quality control. 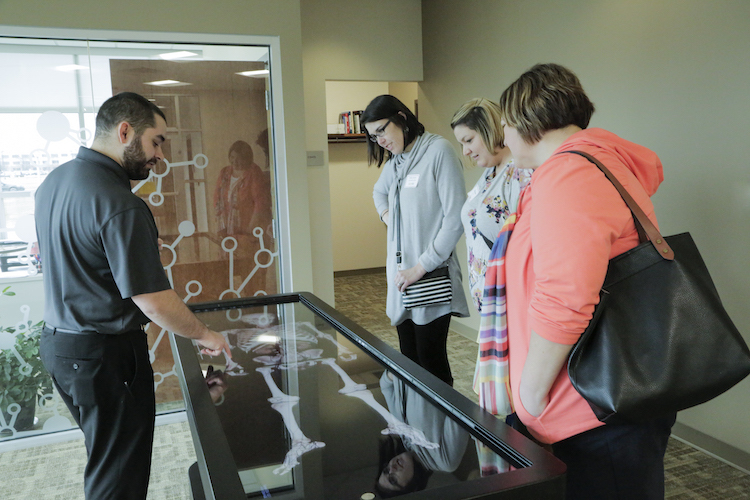 Parkview’s simulation labs allow new hires to get hands-on training experience in clinical situations before they’re working with real patients. Using manikins, virtual reality, and even live actors who impersonate patients, Stam’s team prepares recruits for their first days on the job and helps them feel confident. Parkview trains its new nurses in practicing skills like empathy. Speaking of the next generation, Parkview’s recruits are not the only ones who get to use its state-of-the-art simulation labs. 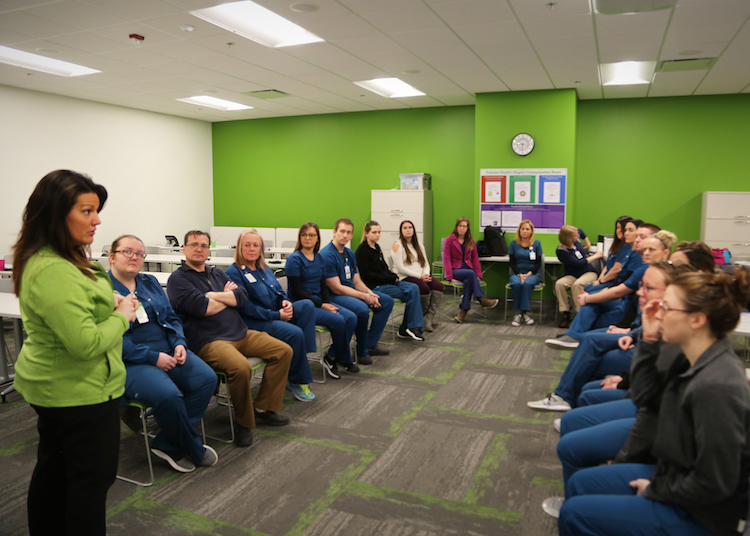 At the Parkview Education Center that opened in 2017, the organization has partnered with Fort Wayne Community Schools and Ivy Tech Community College to help students going into healthcare careers get hands-on experience, too. “They are in the same facility where we do all of our orientations, so they have some of the same learning experiences in their school as we do in our simulation labs,” Stam says. Rice, who runs Parkview’s internship program, says that having hands-on activities for interns increases their likelihood of returning to work for Parkview after graduation. “We’ve made it so they’re just not coming in for three months and making copies,” Rice says. “What we’ve seen is people intern before their junior year, come back before their senior year, and then, when they graduate, we’re hiring them." Along with attracting talent to northeast Indiana, growing talent from within the region is another important focus of Parkview's programs, too. 3. Help employees feel and find their purpose. After the onboarding and orientation processes, Custer’s work retaining talent at Parkview is an important part of the equation, too. As such, her team is encouraging leaders to check in with new hires at 30-, 60-, and 90-day touchpoints, and encouraging leaders to conduct “stay interviews” with longstanding employees. These interviews help leaders evaluate what’s going well for their team, what could be better, and how their team members would like to grow. “It’s about making sure people understand their value and purpose,” Custer says. Parkview’s attention to helping people find deeper purposes in their work is paying off with many employees choosing to stay for their entire careers. Just ask Stam. Going into her 41st year as a Parkview employee, she started as nurse, earned two further degrees at Parkview, and moved into her current management position. She says something the organization does well is helping employees find their passions and achieve their goals—whether they want to be experts in their current practice or explore different opportunities within the network. “We’ve got a lot of development opportunities to help people achieve their goals, so we’re not just attracting them for a job, we’re attracting them for a career,” Stam says. One way Parkview continues to grow leaders is by hosting quarterly Leadership Development Institutes or LDIs. These events happen on Fridays during work hours with presentations by Parkview’s CEO Mike Packnett, national keynote speakers, and afternoon sessions for employees to attend based on their interests. Along with empowering leaders, Rice says Parkview’s personalization in the process is key. When he talks to top talent, one of the main things he hears is that they want “access” across the spectrum—from access to bike trails and nightlife to access to a variety of growth opportunities at work. “There’s such globalization with technology now, that everybody wants something different, and you have to be something different to everybody,” Rice says. 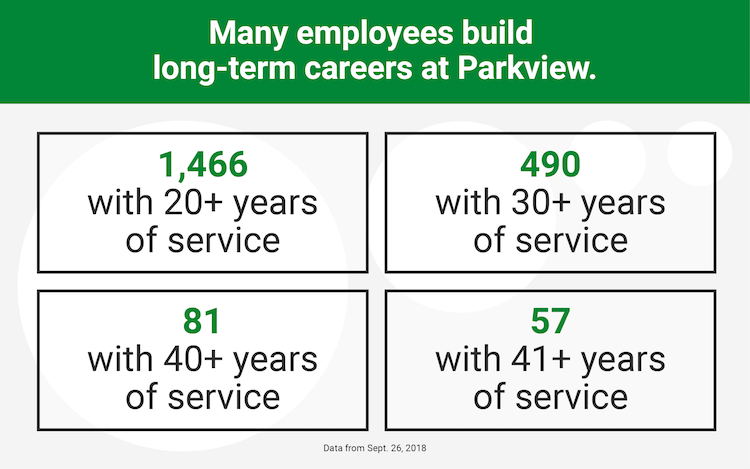 A big way Parkview retains employees is by helping them build their ideal life and career right here, whatever that may be. This Special Report was made possible by Parkview Health. Dawn Etman, Director of Inpatient Rehabilitation at Parkview Hospital Randallia, is one of Parkview Health’s most recent recruits from beyond northeast Indiana’s borders. She moved to Fort Wayne from Tampa, Florida, in August, and she’s been living in the heart of downtown ever since. Input Fort Wayne sat down with Etman to learn more about her recruiting experience, and how she’s adjusting to life in the Summit City. IFW: Tell us about your background and what brought you to Parkview. DE: Most of my life, I’ve lived in Tampa, Florida. Right out of high school, I didn’t know what I wanted to do, but I decided to work at a nursing home while earning my LPN. I loved working at the nursing home because I felt like I had over 85 adoptive grandparents. It was great, but I wanted some hospital experience, too. So once I got my LPN and became an RN, I started working part-time in the rehab unit at a local hospital because that’s where I had experience. I eventually became the Clinical Coordinator of that hospital’s rehab unit, and I was named Coordinator of the Year. Then I moved to Florida Hospital Tampa, and after about 5-6 years, they promoted me to a director position in the rehab unit. I went through a lot of changes with them. We really built up the program, and I met a lot of people, but I got a little complacent there. I’m a change agent. I don’t want to be a fixture in a chair. My ultimate goal is to become the CEO of a rehab hospital, and there weren’t growth opportunities for me with the hospital I was at. So when I met a consultant from Parkview, and she told me about the growth opportunities here, I was interested. The minute I met John Bowen, the COO of Parkview Randallia, and Hallie Custer, Director of HR Operations, I was sold. Their culture here is amazing. I’ve been on a lot of interviews, but I’ve never felt the warmth and welcoming feeling that they provided. IFW: You moved to Fort Wayne and started your job in August. Was it hard to make the transition? DE: Moving from Tampa to Fort Wayne is a major change. It took me about a month to decide to do it. My mom has stage four lung cancer, and she’s back in Tampa, so it was hard to leave her. But with how welcoming everyone was here, I felt confident enough to make the move. John has been so supportive. He really listens to me, and he’s such a visionary. Hallie is great, too. She told me her story about how she came here from the East Coast, and what she went through. That was really comforting to me. IFW: How are you adjusting to Fort Wayne so far? DE: Good. I’m living downtown in the Ash Skyline Tower. I was one of the first ones to be living in those apartments, so I like it a lot. I have a two bedroom right above Ruth’s Chris Steak House. It’s an exciting place to be because there’s a lot of growth happening in this part of Fort Wayne. My rehab managers at Parkview have been amazing in helping me make the transition, too. They’ve invited me out, and I’m sure they’re thinking: Who wants to go out with the boss? (laughs). But they’ve been really accommodating. IFW: What are some things you enjoy about Fort Wayne and some things you miss about being back home? DE: I would really like to see a blow bar salon open in Fort Wayne. Coming from the South, I’m used to getting my hair blown out, and I’ve had to drive to Indianapolis a few times because we don’t have a blow bar here. I always joke that, if I stay, I’m going to invest in a blow bar for the city. But really, there are a lot of nice restaurants here. I’m a big foodie, and I like the selection of food in Fort Wayne compared to what I had in Florida. I like that the city is redoing the downtown, and opening more restaurants, too. It’s cool to see them working on projects like the Riverwalk. I like having different seasons here, too. I’ve been enjoying fall so far, so we’ll see what winter brings. IFW: What would you tell other recruits moving to Fort Wayne for work? DE: Fort Wayne is this secret city that nobody really knows about. I think it’s up-and-coming. It’s like a little town and big city all in one place. People are so friendly here.